Watch a beautiful creative dance performance using praise and worship flags, combined with live music and painting - a unique and rewarding worship experience. Preview DVD trailer below. This DVD combines the action of live creative art combined with the enhancement of music and dance. O4eyes2C makes the perfect gift to give to anyone who has an interest in dance, art, music or in christian performing arts in general. Why use worship flags in worship services? The waving of banners and flags to symbolise many different aspects of our beliefs, culture, heritage or worship has long been a part of our human history. In recent years many churches are experiencing God through worship banners and christian worship flags as part of their worship services. 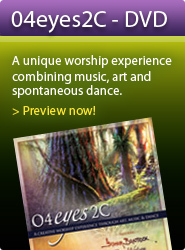 There is often a release of excitement and energy when praise banners are used in conjunction with dancing in worship. Faith is released in the congregation as someone feels inspired to make a declaration of praise by waving a christian banner and flags exalting some aspect of his name. Different church banners can mean different things, and be used to make different declarations. If someone is sensitive to the Holy Spirit in a meeting and responds by making a declaration of praise relevant to the moment in a meeting, then something in the spirit is released in that meeting. Not knowing how to use worship flags in a trained, professional way, does not prohibit its use, as it can be very powerful if it is done simply under the anointing of the Holy Spirit. The use of liturgical worship flags can be used as an expression of praise by anyone who would prefer to worship that way - as opposed to singing or clapping or flag dancing or any other expression of praise – but the use of flags in church by someone who has prepared themselves for this ministry can be especially powerful. The Holy Spirit is involved with us in our worship, and He will use us if we are prepared. He is not going to inspire someone to wave a banner if there are no banners to be found in the church for example, so to be prepared, and to have practiced the art of banner worship, is to show ourselves approved and ready for the Master’s use. Though some churches prefer not to allow flags for christian worship services, where this sort of dynamic expression is allowed, there will always be greater liberty in the Spirit in those meetings. "Where the Spirit of the Lord is, there is freedom." Christian praise and worship flags can be used for a variety of creative purposes within the church worship service. We find praise banners being used in situations of warfare in scripture, and God pushing back the powers of darkness as a result. God may use people in a worship service to wave a church banner as an aspect of praise and worship for the purpose of warring intercession. The first mention of banners being used in scripture is in Exodus 17 when Aaron and Hur held up Moses' arms on the hilltop during the battle against the Amalekites. "Moses built an altar to the Lord and called it 'The Lord is my banner '. He said 'For hands were lifted up to the throne of the Lord. The Lord will be at war against the Amalekites from generation to generation" (Exodus 17:15,16). Isaiah 59:19 tells us, "...When the enemy comes in like a flood, the Spirit of the Lord will lift up a standard against him." Isaiah 31:9 declares "Their stronghold will fall because of terror; at the sight of the battle standard their commanders will panic." We are the redeemed on the earth, and our flag waving is a statement of Christ’s victory in purchasing us and of His ownership of our lives. Psalm 20:5 says "We will shout for joy when you are victorious, and will lift up our banners in the name of the Lord." Psalm 60:4, 5 says "But for those who fear you, you have raised up a banner, to be unfurled against the bow. Save us and help us with your right hand, that those you love may be delivered." One Hebrew word for banner is "dagal" meaning "to flaunt, be conspicuous, and set up with banners." Ps. 20:7 says "we will boast in the name of the Lord." In Numbers 2:2 we read that each tribe had its own banner so the tribes new where to assemble, and the different families were identified by unique banners. The raising of a banner then in New Testament worship can be seen as a declaration of who we are in Christ, what “tribe” we belong to, and our allegiance to Him. Song of Songs 2:4 "And his banner over me is love." Banners can represent many different aspects of God’s character and inspire us to believe and receive His promises to us. Just as God directed Moses to put a bronze serpent on a pole as a focal point, and promised that whoever would look on it would be healed, so too we can look at symbols of the cross or other visual aspects of christian symbolism to inspire us and help us focus on the promises of God. A banner, or flag or any other symbol has no power in itself to heal or deliver, but simply serve as visual reminders of His faithfulness as Jehovah Raphe, the Lord Our Healer, or Jehovah Shalom, The Lord Our Peace, and so on. Flags can help declare a specific event or season. Through the use of flags in worship, we can announce “The King is coming! Prepare the way of the Lord!” Even the simple waving of palm branches as Jesus entered Jerusalem was an act of worship. Children are by nature more energetic and physical in their expression of worship. Flags for children help kids express their heart of worship and keeps them engaged. RED - the blood of Jesus, can declare a release of healing and deliverance in a meeting. Many times a physical demonstration of faith like this can be very powerful under the unction of the Holy Spirit.